When I returned from vacation a few weeks ago and once again immersed myself in my Google-laden existence (which extends to virtually everything except my iPhone), I realized that they had moved the Tasks functionality from Calendars into GMail. I was excited about this shift as I don’t spend a whole lot of time using the Calendar page, given that my schedule tend to be pretty predictable, but I do use GMail all the time. And while my schedule is predictable, the list of long-term, short-term, and indeterminate-term things I have to do isn’t always predictable. So, when I saw the Tasks is now part of my most frequently-used Google tool, I realized that this change should help me keep track of all the things I need to take care of in the near and distant future. 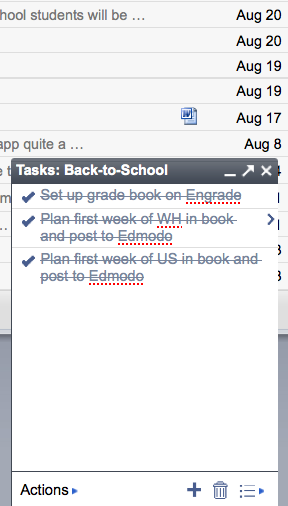 Particularly useful in the new pop-up Tasks window in GMail is the ability to create different Task lists rather than just have everything subsumed in one gigantic “Default” list. Upon figuring this out, I went about creating a “Back To School” list, a “Blogging/Blog Post” list of writing ideas, a “Music to check out” list to remind me about interesting bands I discover via All Songs Considered or Sound Opinions, and the “Default” list of large, typically long-term regular life things I need to address. One of the good things about having this “Default” list in my face with regularity is that I’m less likely to forget about them. The top item on that list is definitely the longest-term project I’m dealing with at the moment, which is to take my (rather verbose) article about the Mormon Pavilion (“…and in the left corner, weighing in at 52 pages…”) published in the Journal of Mormon History’s Fall 2009 Issue, and condense it down to a 6,000 word entry for a forthcoming collection about Mormons and American Popular Culture. I’ve not had to revise a previous work in quite so significant a way beforehand, but I’m looking forward to the challenge and figuring out how to convey my argument clearly and effectively in a much shorter amount of space. 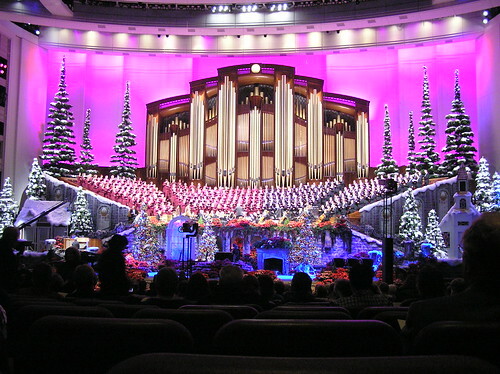 However, Johnson’s article concludes by arguing that this moment in 1962, when the Mormon Tabernacle Choir and their rendition of “The Battle Hymn of the Republic” was broadcast to an ideologically-divided European continent, marked the apogee of LDS integration into the American mainstream. After this moment, Johnson notes, “As the sexual revolution, the drug culture and the social upheaval of civil rights and the Vietnam War advanced, the LDS Church retreated, re-emphasizing modesty in dress and behavior, sharpening the cultural conservatism that remains a church hallmark today.” Therefore, by the “late 1960s and early 1970s […] much of America looked alien through Mormon eyes” given an increasing resentment of Washington and the changing cultural mores. Perhaps because I’m so steeped in thinking about the 1964-65 World’s Fair as a catalytic moment in the history of the LDS Church, I have a hard time seeing this broadcast that took place two years before the opening of the Fair — an event where the Church very self-consciously sought to proselytize to a broad audience — as the last moment of real integration of the LDS Church into mainstream American culture. In fact, it seems that given the Church’s later participation in other World’s Fairs, the rise of prominent and influential LDS politicians (see: Reid, Harry; Romney, Mitt), and the continued expansion into the built environment through the construction of ward houses and temples, that satellite broadcast really wasn’t as end of an era, but instead marked a step in a process of increasing prominence and integration. If nothing else, this article has helped re-spark my thinking about the development of LDS integration into the American mainstream. Hopefully these initial ruminations will shortly manifest themselves in the form of making progress on my encyclopedia entry!